Can Finasteride Help You Grow Real Hair? For many people, the thought of losing hair is as bad as actually losing it. The relatively high percentage of individuals who lose hair makes this condition even more worrisome. Finasteride is one of the few working solutions to this trend. Before we answer if Finasteride can help you regrow real hair, let us consider the most common type of hair loss. This is the most common type of hair loss in both men and women. Alopecia is also known as hereditary hair loss and is progressive in nature. Individual who inherit androgenetic alopecia are born with inherited hair follicles that are sensitive to a hormone called dihydrotestosterone (DHT). This hormone causes hair follicles to miniaturize over time, producing thinner and finer hair. Eventually, the follicles stop producing normal hairs. In men, a receding hairline is very noticeable. There is no recognizable pattern of hair loss in women, but may see a widening part, overall thinning or patchy hair loss. Alopecia areata is an autoimmune condition where the immune system mistakenly attacks the hair follicles, causing hair loss on the scalp, face and other areas of the body. This condition is seen in both men and women. Signs first show in childhood and is thought to be hereditary. There are several forms of alopecia areata, including A. areata (patchy hair loss), A. totalis (complete loss of scalp hair), A. universalis (total loss of hair on scalp and body), and Ophiasis (wave pattern of hair loss). This is the sudden loss of hairs in the growing (anagen) phase. This condition may be caused by exposure to chemicals or toxins such as those found in chemotherapy or radiation for cancer treatment. The condition is generally reversible and hair typically regrows within 1-3 months, but some hair loss can be permanent. 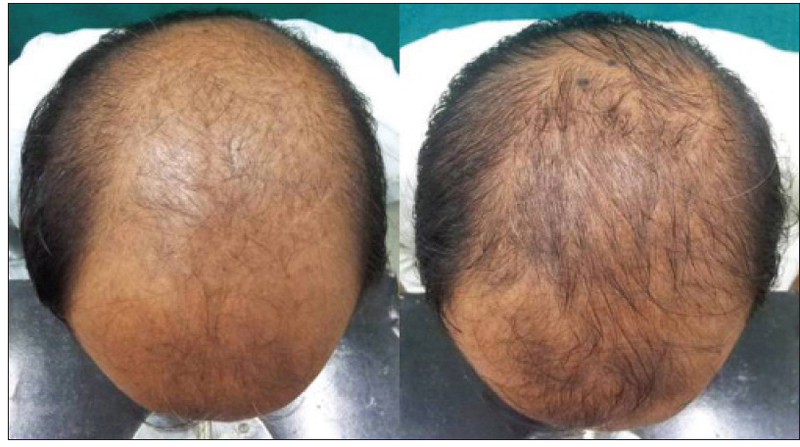 Involutional alopecia is the gradual thinning and loss of hair that comes with age. Over time, a greater number of hair follicles move into the resting phase and remaining hairs become shorter, finer and fewer in number. After androgenetic alopecia, aging is the second most common type of hair loss. Individuals who suffer hypotrichosis are born without hair growth. Rather than having hair and losing it over time, people with hypotrichosis never grow any hair. This condition is thought to be caused by a genetic deviation during fetal development. The answer to this question is not straightforward, not a yes or no. An answer cannot be given without knowing if you are male or female, and the cause of your hair loss. In some of these situations, Finasteride can help you check hair loss, and even regrow real hair, while in others there would be little to no effect from taking the drug. Finasteride is one of two drugs approved by the FDA for the treatment of hair loss. Over the years, the drug has been subjected to several clinical tests and has been approved as a solution to hair loss. This drug is currently used by millions of men across the globe to check hair loss, and it can be purchased from online pharmacy in the uk. Finasteride works well in young men in their 20s and I have seen occasionally young men reverse their hair loss. How Does Finasteride Check Hair Loss? This is one of the most popular question asked by men suffering from androgenetic alopecia. Finasteride works by lowering the level of dihydrotestosterone DHT in the scalp and serum. It is the hormone DHT that shrinks or miniaturizes the hair follicle, which eventually leads to baldness. By doing this, finasteride reduces the rate of maturing hair follicle. By doing this, the drug can maintain or increase the number of terminal hairs in the anagen phase. Propecia 1mg (a popular brand of finasteride) can effectively lower DHT levels in the scalp by as much as 60% (under clinical conditions) when taken daily. Lowering DHT levels is currently the only medically proven method of arresting hair loss. Finasteride is recommended by the American Hair Loss Association as the first line of defense for all men interested in treating their male pattern baldness. Clinical reports show that as Finasteride reduces the amount of DHT by 60% it actively stopped the progression of hair loss in 86% of men who took part in the routine. Furthermore, 65% of trial participants had what was considered a substantial increase in hair growth. So yes, you stand a chance of re-growing your hair by taking Finasteride. The reason for this is the active ingredient (Finasteride) does not of affect only a specific part of your scalp or blocking a specific type of hair loss, it will block DHT at its source. This means that finasteride should slow or stop hair loss and potentially regrow some hair regardless of your specific balding pattern. Because Finasteride works by reducing DHT levels, it prevents you from losing hair around the lines of your hair. However, the information available on prescription emphasizes its ability to prevent hair loss on the crown and top of the head. Finasteride is also scientifically proven to prevent hair loss at the vertex scalp (the area on top of your head, slightly behind your hairline), making it a potential option if you’d like to stop hair loss around your hairline from worsening. While the reports from clinical trials suggest that you stand a chance of re-growing your hair by taking Finasteride, the drug is not manufactured for that reason. The reason why Finasteride is manufactured and the reason it has become so popular is to check the loss of hair. Just as clinical condition differ, so is everyone is different. So, as a general rule, the best way to think of finasteride is as a form of protection against further hair loss, not as a way to regrow hair that you’ve already lost. Can Headache Nausea Possibly Dictate Your Headache Treatment Plan?